Not to be confused with Mario vs. Wario. 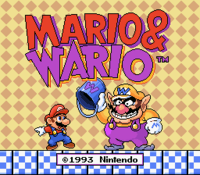 Mario & Wario is a puzzle-platformer game released for the Super Famicom in 1993. It was designed by Satoshi Tajiri and developed by Game Freak. It is one of the few Mario games to utilize the SNES Mouse accessory. The game was initially planned to be localized for the North American market (as shown by it being previewed in the September 1993 issue of Nintendo Power and a Canadian ad for a Kelloggs contest, which featured a tentative box art), but ended up being a Japan-exclusive title. This is Yōsei no Mori. Within the forest's depths lives a fairy, and those who behold it find happiness, as the tale goes. One day, Mario sought the fabled fairy by coming to the forest. Peach, Yoshi and Luigi were together......or should have been, but alas, Luigi's visage was unseen. Mario's group of three had decided to look for lost little Luigi. Then, the sky was overcome with a suspicious engine's sound. What was that? It was Wario riding his personal plane, the Bulldog, and he threw a bucket from the sky. Uh oh, the bucket landed right over Mario's head. "Uwagh, I can't see in this thing!" The main gameplay involves guiding Princess Peach, Mario, or Yoshi to the goal, where Luigi awaits. The player can select one of the original eight stages at the start. Once they are cleared, the final stages become available. At the beginning of every stage except EXTRA, Wario drops a random item on the character's head, making them unable to see where they're going. The player uses the Super Famicom Mouse to control Wanda the sprite and alter the environment to make it safe for the character, making it somewhat similar to the Mario vs. Donkey Kong series. The character will walk left and right on their own, so the obstacles must be manipulated accordingly to allow the character to safely navigate through the level. There is a time limit for each level, and bonus points are given for any excess time. Each character has a set speed; Peach is slow, Mario is medium, and Yoshi is fast. At the end of every stage, there's a bonus mini-game where Wanda can whack Wario with a hammer. Every time the player hits Wario on his plane, the player will earn one coin. After forty hits, the plane will malfunction in Wario's face, but he will also flee if enough time has passed. Luigi The character who waits at the goal at the end of each level. Mario One of the characters who must be guided to the end of each level. Princess Peach One of the characters who must be guided to the end of each level. Wanda The character who must guide each character to the end of each level. Wario The main villain who is fought after every world in the game. Yoshi One of the characters who must be guided to the end of each level. Dodorigesu Jr. These immobile Pidgits can be defeated by simply clicking on them. Guriguri A fireball which usually moves along walls and floors. Komorin Tricky bat enemies that often group together in packs of four. Tsubōn A pot-shaped enemy with a skull mark that can cling onto walls and breath fire. Unibō Spiky enemies which resemble Urchins and appear in LEVEL 6 and LEVEL 9. They come in blue variations that move up and down and yellow variations that move left and right. The fairy's forest is the easiest stage of the ten, and a tutorial for the rest of the game. The world map for each course fits on one screen, making them the smallest of the game. One Girigiri is introduced in the last course. A world set next to a relaxing lake where Yoshis have holiday. It is still a standard stage, but slightly harder than the first. A mountain region. Timer Blocks are frequent, so sitting around is dangerous. An icy cavern with many frozen features. Nebaneba Blocks appear towards the end. A subterranean cave filled with magma. Pot-shaped enemies called Tsubōn are introduced here, and will breathe fire at the player. A large body of water infested with Unibō. Switch Blocks are frequent. An area in the sky. Fūsen Blocks are frequent. A vast desert location. Guriguri are frequent. Wario's personal garden, which is playable once beating the previous eight stages. A big, untidy residence. Playable once LEVEL 9 is cleared. An extra stage revealed once beating all ten stages. It is a very difficult world. Coin Block Wanda can hit these to collect coins. One hundred coins will give the player an extra life. Elevator Once on these lifts, the character must wait until they can move again. Flip-Flop Block One of the most basic blocks, they can be made solid or passable with the flick of a click. Fūsen Block Balloons which expand and inflate from time to time. Hibi Block These cracked square walls can be hit to be destroyed. Jump Block Jump Blocks look like springboards, and are usually seen grounded on flooring rather than suspended in the air as in other games. Nebaneba Block These blocks are sticky and trap friend and foe alike. Switch Block These switch from solid and red to blue and intangible. Timer Block Hitting these blocks will make them solid for a short time. Wanda must know when and how to use them. Toge Block These pointy obstacles take up the full space of a block. They can face four directions. 1-Up Mushroom As the name suggests, these green mushrooms give the player extra lives. Coin Coins add points to the player's score. Collecting one hundred coins gives the player an extra life. Star The most common item in the game. Collect four of them in a level to earn an extra life. Time Kinoko Standard mushrooms that add to the Time Gauge. There are not many of these in the game. For this subject's image gallery, see Gallery:Mario & Wario. For a complete list of media for this subject, see List of Mario & Wario media. Mario to Wario Mario & Wario or Mario and Wario; used in packaging and promotional materials. There was a mention of this game in the Generation I Pokémon games and their remakes. When the player checks the Super Nintendo in the Copycat's House (at Saffron City, northwest of the Silph Co. building), it states that there is a game that shows Mario with a bucket on his head. The games are also made by Game Freak. 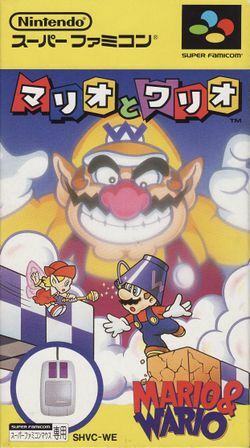 A reference to Mario & Wario is made in Mario and the Incredible Rescue, where Wario attacks with buckets. The bucket Mario wore on his head is a trophy in Super Smash Bros. Melee. It mentions that "the bucket's M looks like a W when turned upside down". One of Junker's attacks in Mario & Luigi: Bowser's Inside Story is dropping a bucket on Mario or Luigi's heads and they walk back and forth, using a similar animation to the ones in this game. Although a Japan-only release, the game itself contains no written Japanese whatsoever; it is entirely in English. ↑ Mario & Wario instruction booklet, page 2. This page was last edited on April 6, 2019, at 14:03.